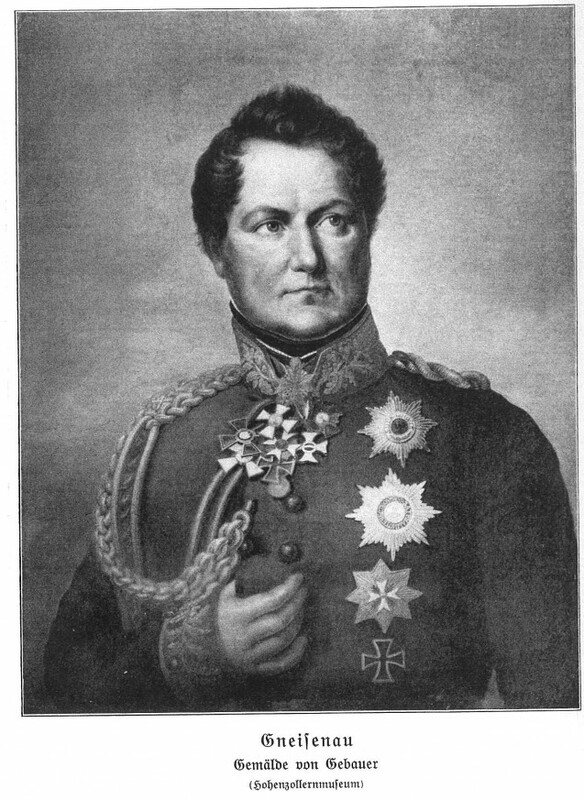 Gneisenau was Blücher's Chief of General Staff in the Prussian army of 1815. He was born in Saxony and entered Prussian service in 1786 with a light infantry formation, but only began combat a decade later. Previously, he had been in the service of the English in Canada, between 1782 and 1783. Gneisenau distinguished himself in the 1806 wars against the French, successfully defending the Prussian fortress of Kolberg. From 1807, he was engaged in the modernisation of the Prussian army along with the War Department director, Scharnhorst. They were responsible for abolishing birth privileges and introducing merit-based recruitment, and together they masterminded the Krümpersystem, which involved training soldiers quickly and sending them into reserves. Scharnhorst was killed at Lützen in May 1813, so Gneisenau was appointed Chief of Staff to Blücher's army. Gneisenau is generally held to have been more cautious than Blücher, although not all accounts agree: the early twentieth-century German historian Pflugk-Harttung punned that ‘in einem Punkte waren beide sich ähnlich: auch Gneisenau wagte lieber, als er wägte' (‘The two men were similar in one respect – Gneisenau, too, was not backward in coming forward'). Furthermore, he was less trusting of the British – the English historian Sir John Fortescue wrote in his History of the British Army that ‘though [Gneisenau] hated the French, he did not love the English'. After the Waterloo campaign, Gneisenau became governor of Berlin and commanded the Prussian troops in Poland in 1831. He died of cholera that year.